I have never really understood why tool chests are such a controversial subject. Breathe a whisper about them online and watch the fervor begin and the shouts of "Wall Hanging Tool Cabinet" begin. I have been working out of my tool chest for two years now and the system really works for me. That doesn't mean I think it will work for you. You're on your own when it comes to finding your own bliss, no one else should be responsible for that. I use two tool chests in my shop. The first was built in Norway in the 1800's and carried the tools my wife's great-great-uncle brought to help create their new homestead. I keep some odds and ends in there along with my green woodworking tools. Being given that chest inspired me to build my own, and while I was in the research phase Chris Schwarz published "The Anarchist Tool Chest." I love the book and found the chest he presented in the pages to be a straight-forward, down to earth, bomb proof badass. Something to last for the ages. I used the plans as the pattern for my tool chest. I have a third tool chest I use intermittently when I take my show on the road. 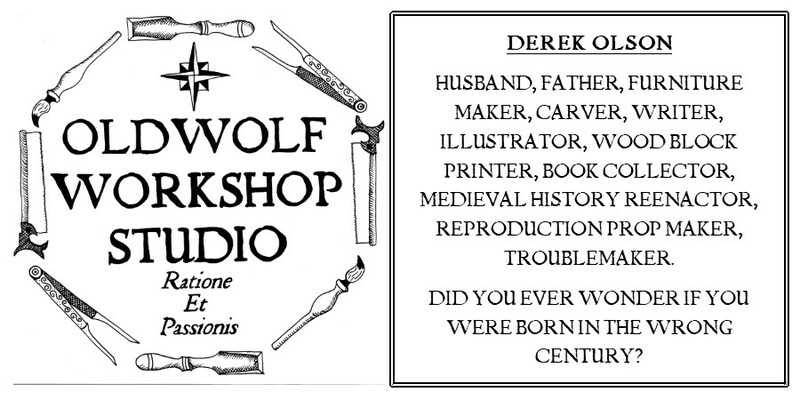 I'm part of a group that does medieval living history displays and demonstrations. Most of the time when I get to participate I will do a carving and woodworking demo. I pack up and bring my knock down Joinery Bench, my Saw Benches and a small chest full of tools. I never really though about the small chest much until I read a post on Jeff Miller's blog. He was toiling away at the FORP (French Oak Roubo Project) and blogging about it in a unique way. Instead of providing a blow by blow of the days events he tool collections of pictures documenting each of the participants. One series of everyone's hands, one of everyone's saw horses, and one of everyone's traveling tool chest. Several years ago one of the woodworking mags (I think it was Pop Wood) ran a contest to build something with one maple board. I decided I wanted to build a Viking age sea chest but juice it up a little with some carving and tricky joinery. Sea chests are six board chests with the sides slanted in towards the top. The size of this one in particular is based on the Mastermyr chest. At the time I was really proud of this "showpiece." Time and experience have shown me where my mistakes are and why the build was kind of mediocre. However, it's still a box of reasonable size and somewhat historical shape, so it works to haul a small surplus of tools around. First are the three items I can't usually fit in the chest. My heavy bench mallet, a pair of holdfasts and my Anarchist A frame square / libella. I bring the libella not so much because I use it in laying out carvings, but because it's a great conversation and teaching piece. In the end it really is amazing how many tools you can fit into such a small chest. Enough to fill six foot of my eight foot benchtop. I have a canvas roll of my carving tools and one of my chisels. some smaller wood rasps and a card file to clean them. A pencil, marking knife, scratch awl, 6" steel rule and marking gauge. An assortment of dividers, very important in laying out the carving style I work on. The big bench mallet doesn't travel in the chest usually, but there is also my smaller carving mallet, a carpenter's mallet and small brass mallet for adjusting the horned plane I bring with. I love this plane as it's so versatile and can scrub off a lot of material or a very fine amount for smoothing. I bring a pair of sectors, some wooden bench dogs, a brass plumb bob and spool of string. I bring a small flexible pull saw I put a wooden handle on because it's very much like the saw found among the Mastermyr tools. There's a wooden tri-square, a bench brush, a couple offcut blocks I use to pad my holdfasts and a block of gulf wax.Inside the chest also travels a couple carriage bolts, a pair of pliers and an alignment tool/drawbore pin to help put the legs on the bench when I get to the site. I get a lot of questions about the carving I'm doing, mostly from kids. Unfortunately adults seem more reserved to just watch me work and I have to start asking them questions to get them to interact. If I do get questions from adults the number one, hands down, is about the holdfasts I'm using. Such a simple piece of technology garners the most interest. Sometimes I wonder what that says about us as a society. As a whole we seem to strive for the most complicated, over engineered gadget possible to perform a task. When sometimes you just need a piece of steel and a little friction fit to get the job done. There's a dirty joke in there somewhere, but I think I'll refrain this time. This set up works well for me at this time. I've considered doing a different demo building some six board chests by hand and that will require a few more tools, more planning and possibly a different knock down bench. 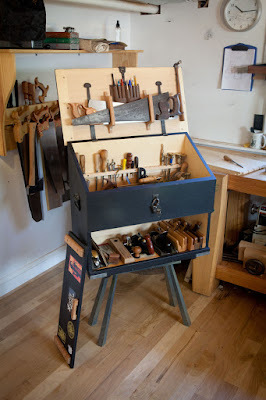 If I head in that direction I will probably build myself something more akin to Chris Schwarz's Dutch Tool Chest. We'll just have to see what will come of those ideas. P.S. The Mastermyr find has fascinated me for years and it's difficult to get your hands on the book documenting the find. If you want to see the images of other Viking age tools from the find you can check out this website and enjoy. http://www.netlabs.net/~osan/Mastermyr/ImageLib.html It's amazing to me the way tools have not significantly changed in a milennia or more. I just finished the Schwarz tool chest class here, and loved it. It was really interesting seeing all the different tool carrying stuff the students brought. A couple big plastic totes, but a number of hand made boxes as well. I know what you mean about the "wall hanging" vs "tool chest" arguments on the web, but that mainly seems to be the sawmill creek type forum where it's a lot of entrenched ideas and no openness to new/old ideas. I gave up on those forums a while back, and stick to blogs of people who are more open (like yours). I still need to make the lid to my tool chest, but I'm carving the inside first so it will be a bit. Ps. the Mastermyr Find book is fantastic, I have a copy that I read cover to cover. such amazing stuff. Badger, I'm just hanging around waiting to see the final pics of the traveling box you carved and built. I do have a copy of the Mastermyr book, you can buy them off Amazon but it took about 6 months to get it delivered and the binding job they did on it is crap, it's starting to fall apart on me and I'm considering trying to find options to get it rebound.